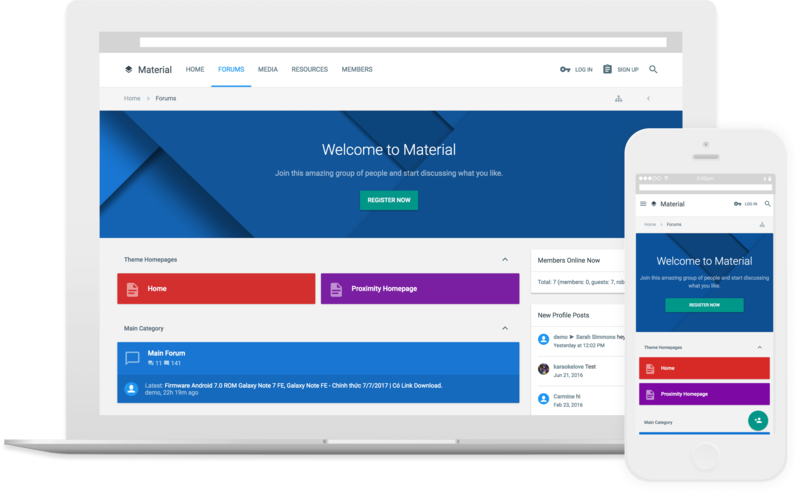 Material is a theme inspired by Google's Material design spec, whose purpose is to enhance legibility, be bold and intentional, and bring real life movement and depth to the web. Built on the UI.X Framework, Material not only benefits from the styling control and functionality of its parent, but also builds greatly upon it, bringing new features to XenForo. Featuring a simple to use unique metro node styling system, you can bring your Node grid to life. Some of it's other great features include an extended color palette, a brand new off canvas menu, a beautifully re-designed member card, floating action buttons, and a free and extended copy of [TH] Covers add-on with coupon MATERIALCOVERS (add product to cart first! ), with 4 additional user banner locations. With it's bright bold colors, and perfected legibility, Material brings the best design spec of our age to XenForo.